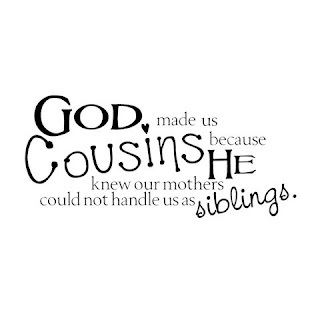 Searching for some funny and cute quotes about cousins. If yes, now you don't need to search for them. As here I have compiled down some of the cutest cousin quotes and sayings. Just hope, you will like this quote compilation and able to find something cute and funny to describe your relationship with your cousin. God made cousins because he knew our mothers could not handle us as siblings. A cousin is the one who is already there doing it when everyone else is saying is there anything I can do? Friend of my bosom, thou more than a brother, Why wert thou not born in my father's dwelling? God made us cousins, chance made us friends. Cousins are some that are always there for you no matter what happened. Friends are forever, cousins are for life! !